We recently mentioned, Memory Lane's I Own It Now sale and although many of the higher-end items did not sell, multiple collectors took advantage and bought high-end pieces of sports memorabilia as easily as buying books on Amazon. 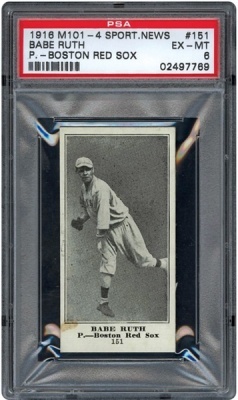 Leading the way was a PSA 6 1916 Sporting News Babe Ruth rookie card, which netted six figures. View the complete results here. The next I Own It Now sale will take place in early 2012. 1948-49 Leaf Premium Babe Ruth BVG 4 Light background No text. Tough variation! Babe Ruth Collectable cards & 1947 Speech on record. 1948-49 Leaf Premium Babe Ruth BVG 1.5 Blue background No text. VERY RARE! 2019 Bowman Matt Chapman 1 1 yellow printing plate yellow 1:17,000 packs rare!